KUALA LUMPUR: THE Land Public Transport Commission (Spad) has narrowed down three possible structures for the Southern Corridor high-speed rail (HSR) project with Singapore, involving ownership, management and governance. 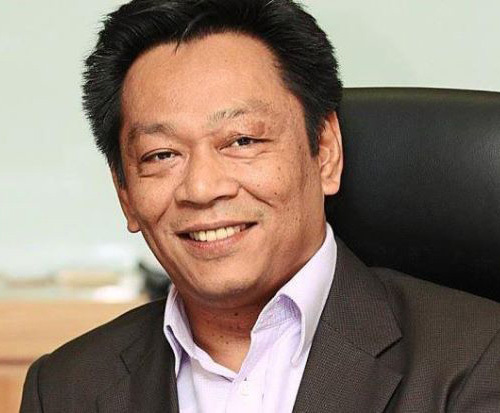 Spad chief executive Mohamad Nur Ismal Kamal (pic) says the Southern Corridor HSR project could be developed either under a public-private partnership or private finance initiative. “When the structure of the project is finalised, it will be clear as to what the project tender will look like. It could be either for management, ownership or concession. “And the deadline for the bilateral agreement with Singapore will be in the third quarter of next year. We would have preferred if this phase 2A feasibility study had been done earlier,” he tells StarBizWeek, while not elaborating on the third option of the project structure. Spad is now undertaking the most crucial part in laying the foundation of the HSR project, dubbed as phase 2A. This includes the Governments of Malaysia and Singapore’s engagement and agreements, technical surveys, socio-economic analyses on the stations, environmental analyses along the alignment as well as the setting up of a dedicated HSR team. According to schedule, the timeframe to begin construction is late next year, giving Malaysia just enough time to get the line up and running in 2020. On the other aspects to consider, Nur explains it will depend on the mechanism to be agreed with Singapore that mainly includes the division and sharing of the construction cost, ownership and revenue. Although Nur cannot reveal the cost of construction as yet, it has been reported that the price tag of this massive project could be over RM40bil. “On our part, we have to choose the most beneficial way for Malaysia to take on this project as one of the main catalysts for it to become a developed and high-income nation,” he says. While not too worried about construction challenges, Nur points out that the cross-border nature of this project would be its most difficult aspect. However, the keen interest shown by both countries to make it happen would hopefully speed things up, he adds. The other crucial challenge of this project is public perception, stresses Mohamad Nur, where the focus should be on the easy and speedy connectivity between Kuala Lumpur and Singapore that should spur new economic hubs along the alignment. The cross-border HSR line has the ability to transform Malaysia, especially in terms of providing new platforms to grow the economies along the connecting cities. Spad has revealed its five proposed connections in Malaysia for the project, namely, Seremban, Ayer Keroh, Batu Pahat, Muar and Nusajaya in the Iskandar region before slithering down to Singapore with another possible three foreign stations. However, there are other potential stops in Malaysia that Spad cannot reveal at this point. While most of these stops in Malaysia do not have a high population density, Nur believes the project would boost the profile of the connecting areas, which, in turn, will attract new investments. “These are greenfield areas. The HSR will lead to the growth of higher economic activities, it will shift more potential customers and talents,” he says. The HSR is estimated to save up to 1½ hours of travelling time as opposed to boarding a flight with a capacity to carry about 500 passengers in one sitting. 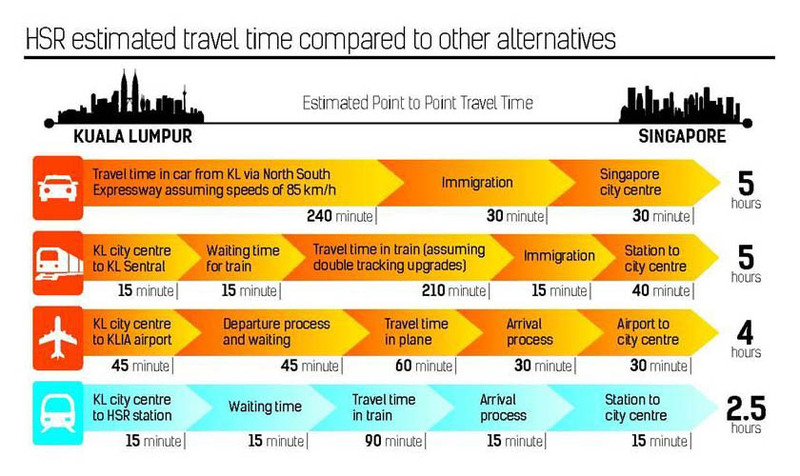 The total estimated time for the 350-km journey from Kuala Lumpur to Singapore is two hours. It will provide two types of services – the first being an express service between Kuala Lumpur and Singapore, while the other is a transit service that will stop at all five proposed stations. Nur expects the HSR to bring benefits to the quality of life, employment and talent opportunity in the areas it will serve. “It is important to get the policies right in the first place, because once you create this magnet for business, you need to ensure the right businesses come in,” he says. Among the potential industries identified to spur growth at the hubs along the corridor are bio-technology, tourism and healthcare, education, electronics and electrical, design and manufacturing. “HSR hubs have the potential to create economic zones to support the Economic Transformation Programme (ETP). Now, we have a chance to earmark these places to become industrial hubs, specialised hubs and clusters, as well as to start pushing those areas that have unparalleled mobility to both Kuala Lumpur and Singapore,” Nur says. He adds that while the HSR project has been deemed costly by certain quarters, Malaysia cannot afford to go without it, especially since the country is aiming towards high-income-nation status. “We have to look at the economic investment perspective in terms of the value it can generate and propel us towards high-income-nation status. We cannot afford not to do it,” he says. This is apparent in China, which currently holds the longest HSR network in the world of about 10,000km in total, that has transformed the country in terms of higher productivity, new district developments and allowing businesses to reach bigger markets. According to the recent ETP report, it is estimated that around 400,000 commuters will use the link daily once the rail is operational, as well as attracting multinationals who want to take advantage of the improved connectivity between the two countries. The construction of the HSR is expected to add RM6.2bil to the gross national income and stimulate gross domestic product by 0.5% a year during the construction period, besides raising foreign direct investment in Malaysia. Analysts are expecting the construction and property sector to gain the most from the HSR project. “We should look beyond the construction benefits. The indirect advantages from the HSR are far greater,” says Nur. What type of fares can we expect? Where fares are concerned, Nur strongly believes they should commensurate with global standards of HSR services. “The type of fares could be packaged according to the different classes of travel, such as business and economy, comparable to budget airline fares. And there will be express and transit services, which would also determine the fare structure as well. " “Passengers can also make advanced bookings for cheaper fares as opposed to last-minute or over-the-counter purchases,” he says. In terms of rolling stock, he says the train, with the speed of 300km per hour, could be in the form of a standard 200m train with eight coaches, with the option of adding another eight more coaches if need be. Beyond the Southern Corridor HSR development, Nur hints that there could be more HSR lines or networks in the future, covering the northern and eastern parts of Peninsular Malaysia.